Pono ukuleles are designed in Hawaii by the renowned Ko'olau Guitar Co, and manufactured in Indonesia. Pono ukuleles offer a high quality instrument, made from solid wood, at cheaper prices than Hawaiian made ukuleles. Since their introduction, Pono have made a name for innovation. 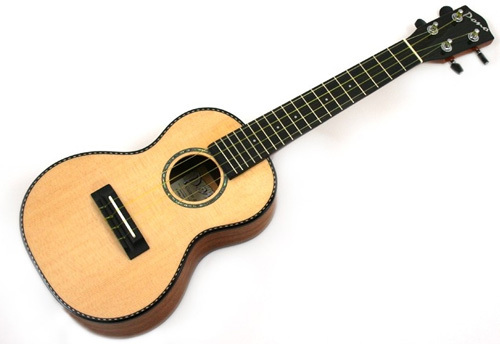 They were one of the first production ukuleles to include a truss rod in some models, and one of the first to develop ukuleles from different woods, such as mango and ebony. The Pono ukuleles really come into their own in the bigger sizes. The soprano sizes I always found to be a bit on the quiet side. One of the Ohana SK models will be much louder for example. But a concert or tenor size Pono ukulele is really where it's at! The choice of wood of course depends on your own tastes (and what's available). Overall I think I would prefer a mahogany, being a bit of a traditionalist. However, you can find Pono ukuleles in solid koa, mango, and spruce. Pono ukuleles usually come with a Ko'olau hardshell case. These are some of the best quality ukulele cases available. So although the prices of the Pono ukes may appear higher, remember, it could well include a top quality case. Sadly these cases aren't readily available to buy seperately. The Pono range was designed and developed by John Kitakis at the world famous Ko'olau Ukulele Company. Each instrument is handcrafted under strict quality control by Ko'olau on the Island of Java. The attention to detail is superior to any instrument in this price range. The Pono range of ukuleles includes models from solid mohogany, spruce and mango, in soprano, concert, tenor and baritone. The sound is clear and well balanced, with a lovely, warm tone - reminiscent of vintage instruments. There have been some rumours of changes to be made in the production of the Pono ukuleles. Hopefully this will mean they become more readily available, with an even wider choice!